Are you getting all ready to celebrate the 4th of July?! I can’t believe it’s already just a few weeks away! 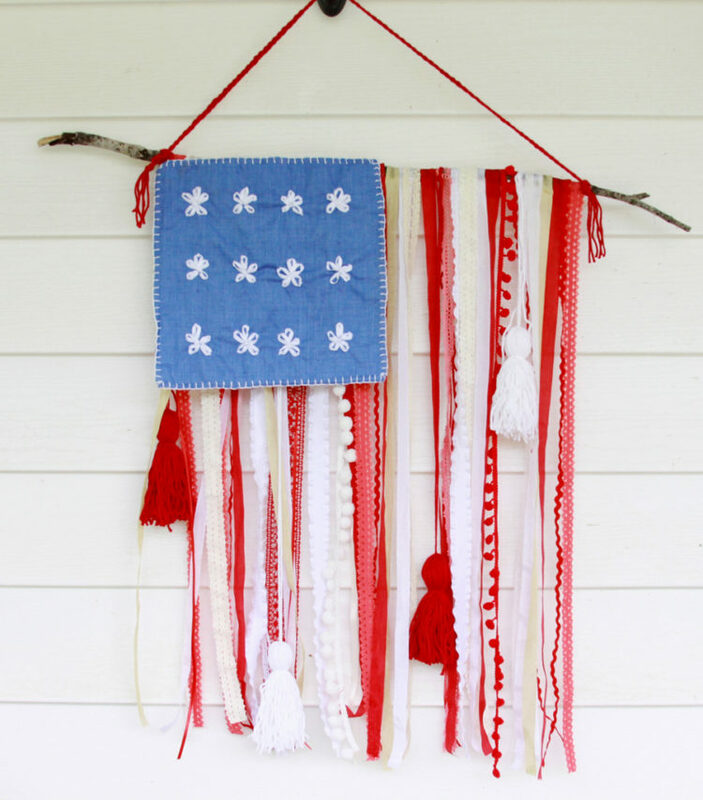 I’ve been pulling out all my patriotic decor, and looking for fun new things to make too! 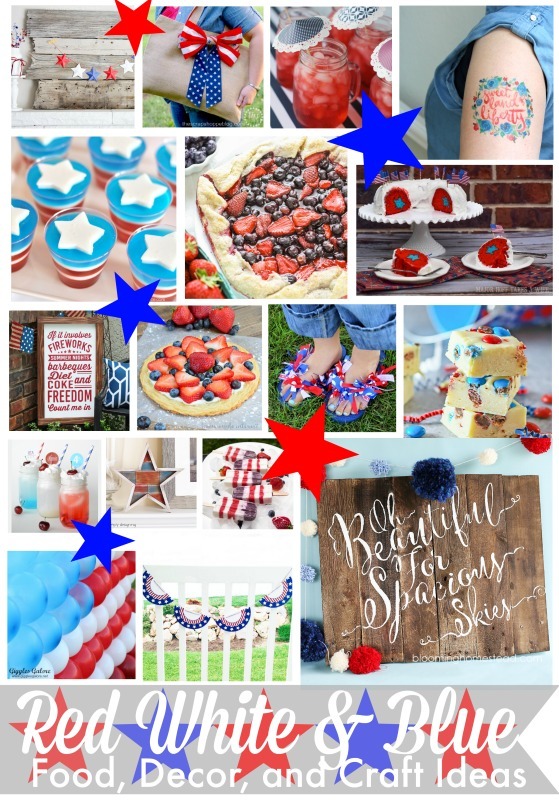 I’ve gathered together with a bunch of blogger friends and we’re bringing you bunches of Red White and Blue inspiration today! 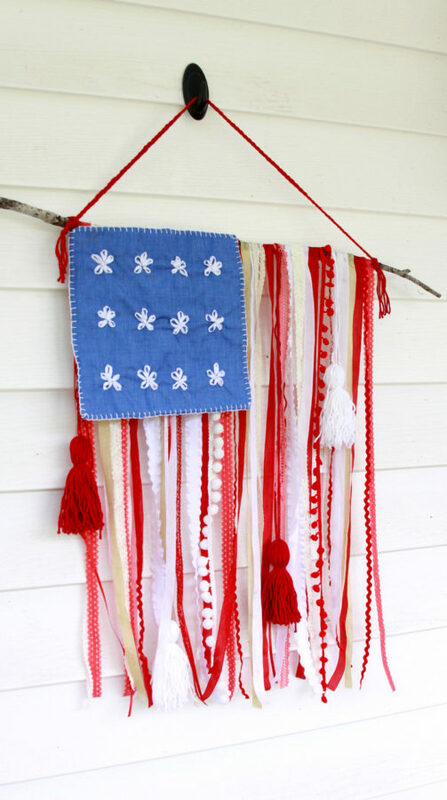 At the end of the post I’ll have a big link up with a ton of inspiration and project ideas – but before we get to that let me show you my project – this Rustic Ribbon and Lace USA Flag! I’ve been wanting to make a boho -chic version of a US flag for a couple years now – and I had so much fun putting this one together! 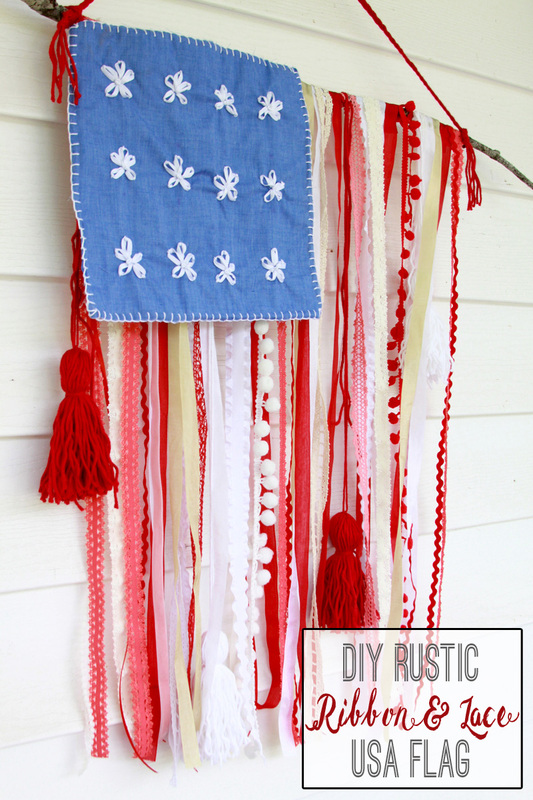 It’s super easy to make – just a bunch of pretty red and white trims all decorating a rustic stick. So fun right? 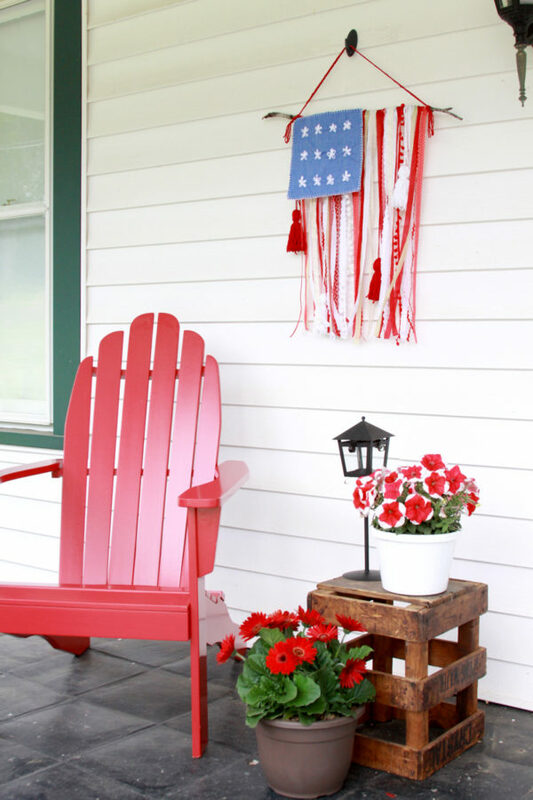 I hung it on my front porch near my Adirondack chair and some pretty red and white flowers – it makes a sweet patriotic display don’t you think? Begin by marking your stripe sections along the stick. You want a mark every 1 3/8″ to make 13 stripes. 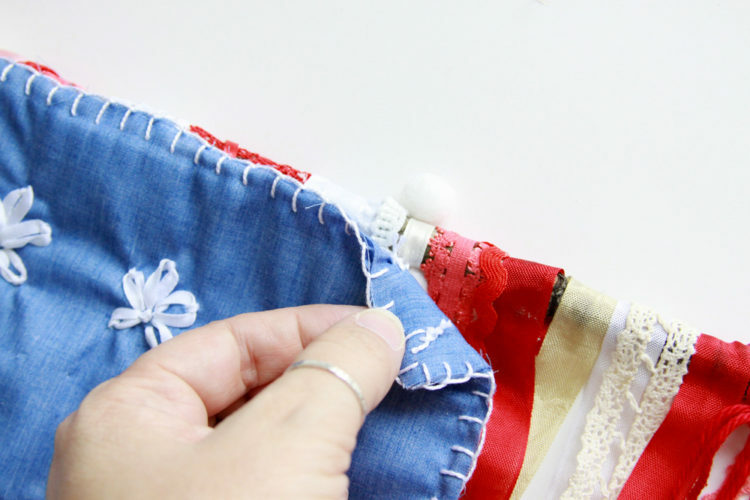 Cut your stripes of trim and lace – each strip should be 26″ long. Lay the strips over the stick in the stripe sections so you can see how it will look and if you need to add any trims anywhere. Begin gluing your strips around the top of the stick, overlapping any you need to as you go. You’ll just wrap the top part of the ribbon around the stick and glue it to the back side. Make sure the stick is laying flat as you glue so the ribbons hang correctly. Mark where you’d like your ribbon stars on the 10 x 10 fabric piece. I did 3 rows of 4 stars each. Form the stars by embroidering lazy daisy stitches in a star shape. 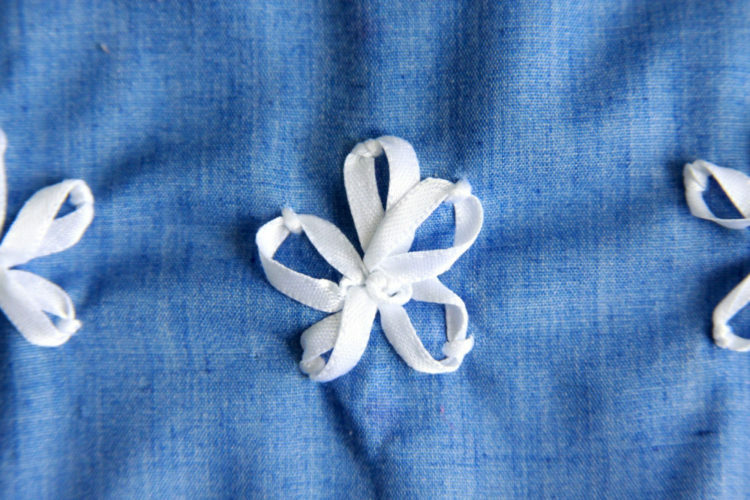 You can find embroidery stitch tutorials on my blog. Stitch a loose little French Knot in the center. 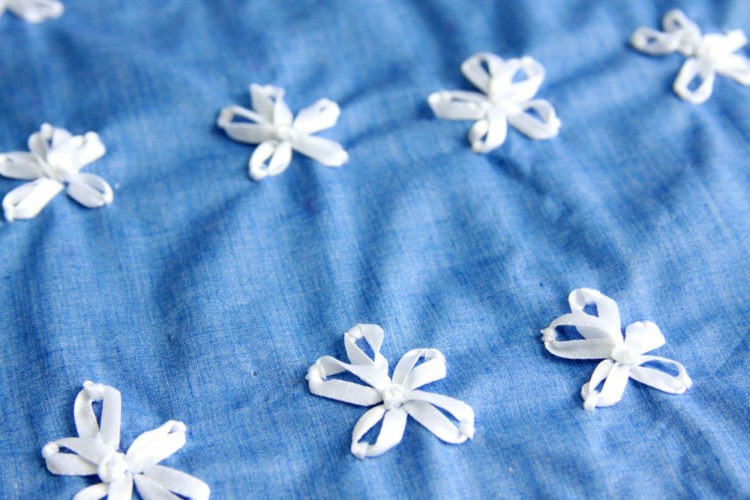 You could also paint on some little stars or even use a printed star fabric if you don’t want to do the little ribbon stars. Super easy. Layer together the top piece with the stars, the fleece, and the other piece of 10 x 10 fabric. 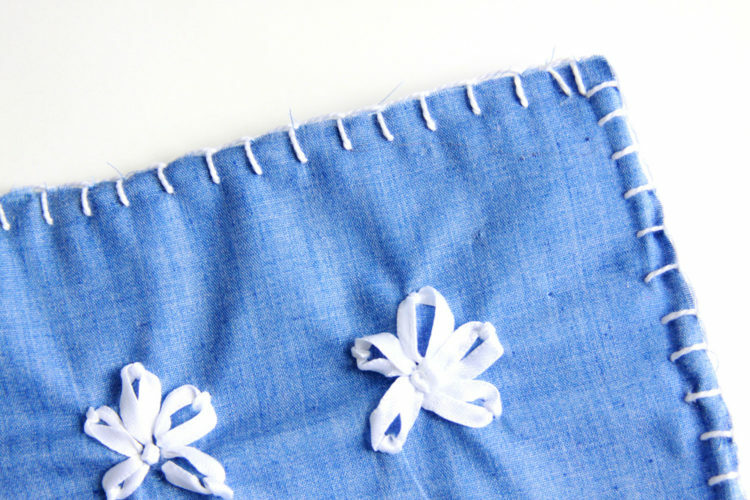 Stitch the pieces together with the pearl cotton using a blanket stitch around all the edges. Cut a length of cardboard the size of your tassel. Mine’s about 4″ tall. Wrap the yarn around the cardboard 50 or 60 times. Cut the yarn at the bottom. Cut a long length of yarn and feed it under the wrapped yarn. Pull it up to the top and tie a tight knot at the top edge of the looped yarn. Slip the looped yarn off the cardboard. Cut another length of yarn and tie a knot around the wrapped sections, about 1″ below the top. Cut the loops at the bottom of the tassel. Now you have a cute yarn tassel! Tie the tassels onto the stick at different heights on the flag. Stitch a small section of pearl cotton to the back of the star piece and knot the thread around the stick on the left side, over the stripes of trim. 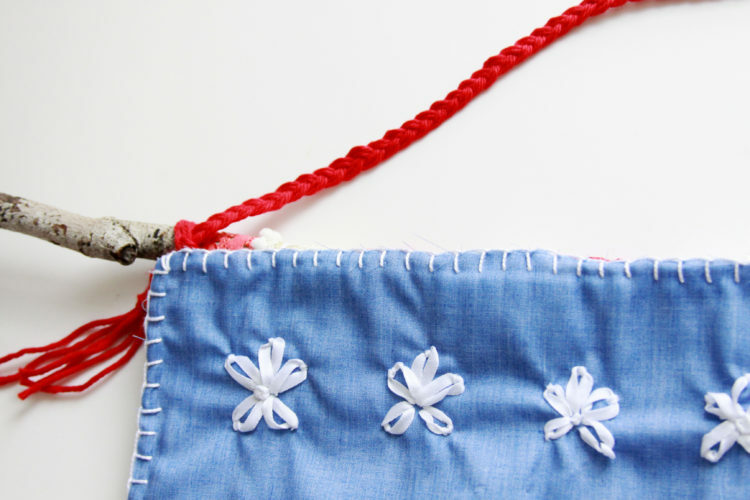 Make sure you hang the fabric piece straight and you knot it at both ends, and if you need to in the middle. Cut 6 pieces of yarn, about 1 1/2 yards each. Line up the ends and tie a knot in all six strands, about 3″ from one end. Braid the yarn using 2 strands in each section of the braid. When the braid is long enough for your hanging piece, knot the other end. Tie the braid around each end of the stick to hang the flag from. Hang up your flag – you’re all finished! It’s such a fun project! It would be great as a girls night craft don’t you think? So easy right? I love how it looks on the front porch. 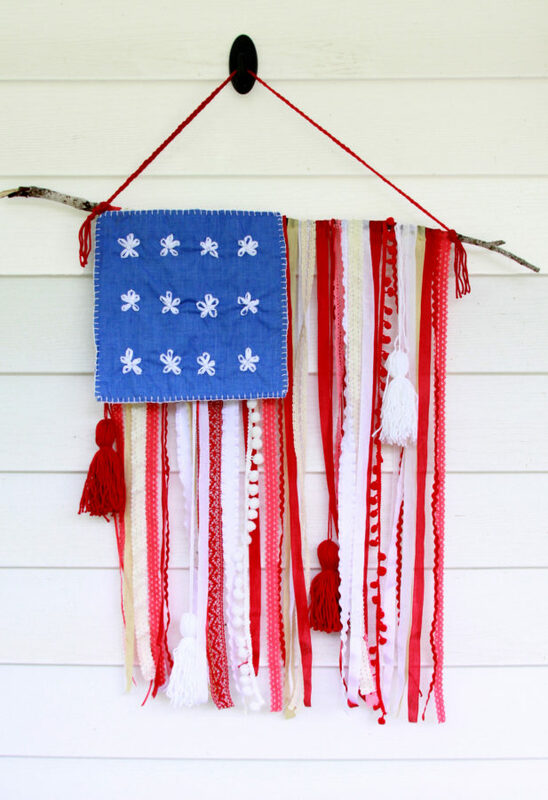 You can also check out even more Red, White and Blue projects at this fabulous Pinterest Board! 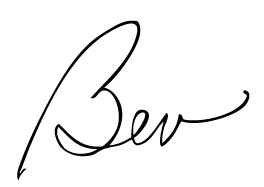 This is just gorgeous, Bev! I love it! This is the cutest! 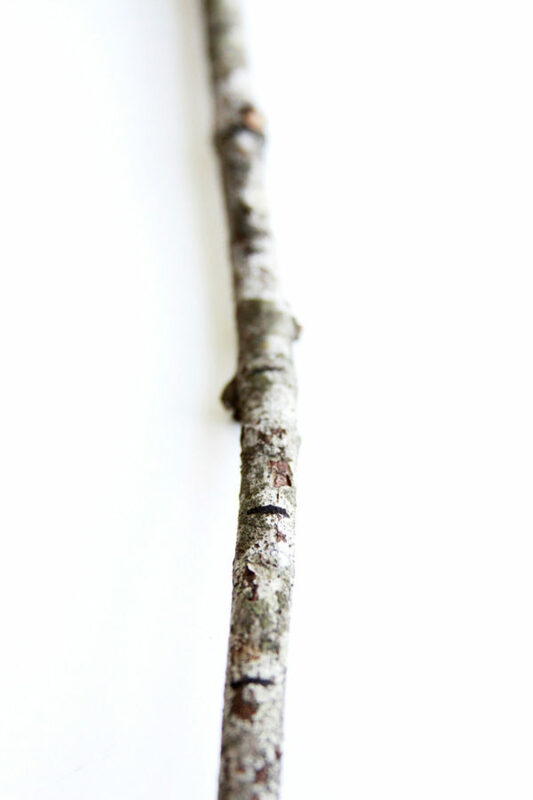 I love everything about it, right down to the twig! What a fun idea! And the set up on your porch is gorgeous. On 4th of july we will have our birthdayparty. Although we live in Germany, we want to celebrate our birthdays with American food and matching decor. 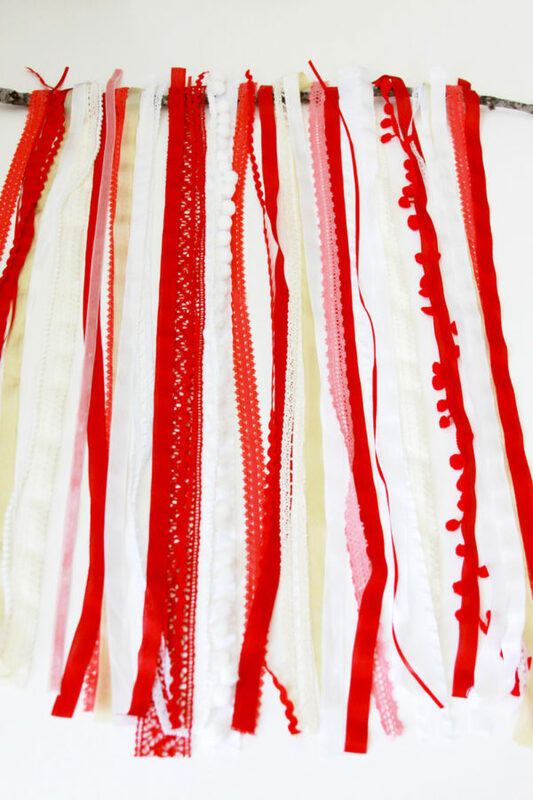 So I am very enthusiastic about your idea to make the flag of ribbons and lace. I love this! A little shabby chic and still so patriotic. I love all the differently textured ribbons you used. Very pretty! I absolutely love how that turned out. You are so darn creative! Thanks for sharing at Throwback Thursday! What a sweet, sweet flag! Thanks for bringing this by Throwback Thursday! Just completely brilliant Bev! Now I’m thinking if this could be done with the Israeli flag as well…..might not be as cute though as only blue and white. thanks for sharing on craft schooling Sunday! I love this, it looks adorable! Thanks for sharing this at the Dishing It & Digging It Link Party. Thank you for sharing at What’d You Do This Weekend? Your flag will be featured next week. I think this is the most unusual American flag I’ve seen. I adore things like this.